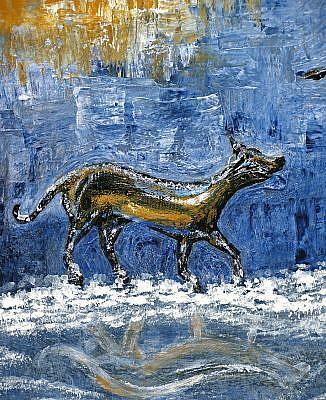 "Fetch" is a large (16x20") colorful textured acrylic painting of a wintery scene. It depicts a dapper, smartly-dressed gentleman sporting a derby (or bowler) hat and a colorful cashmere topcoat playing with a dog that sports similar colors in it's own fur coat. They are having a fun romp in the snow on a cold winter's day. 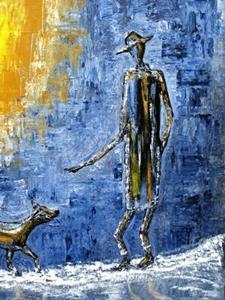 Although it does depict two characters; the man & the dog, the overall painting has an abstract feel to it, since there are no real defined physical features on either the man or the dog. We know what they are simply from the silhouetted shapes. Also, the background has a lot of texture and variations of color for interest and depth. The man & dog are interacting with each other in this fantasy scene. The relationship between man and canine has a long history and is a mutually beneficial one. 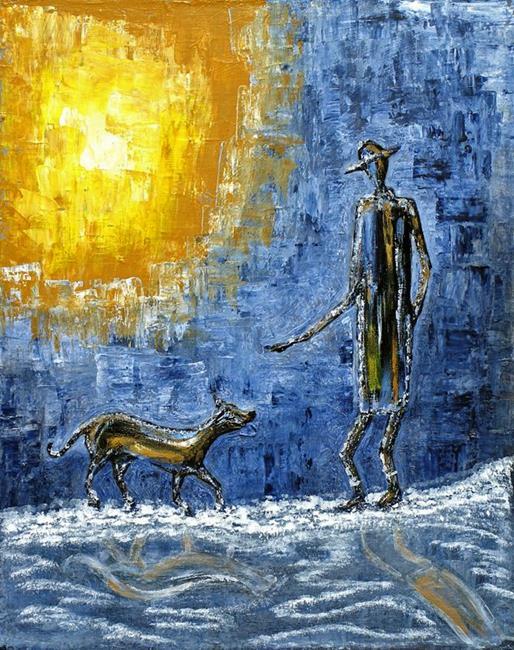 Man provides dog with food and nourishment, and in return dog provides unconditional love and loyalty to it's owner. What more could you want in a relationship? The big bright hot yellow sun on the upper left side is warming the scene and melting the cold and snow away. The white snow drifts are kind of swirly (I created them with a thin white glaze over the blue background) and the snow has a faint image of both the man and dog reflected in it. The overall feeling I was trying to convey with this piece is one of a cold winter's day turning into night, and the scintillating sun that is warming things up... this man depicted may (or may not) have enough money, or food to eat, but either way, he still has his best friend to provide comfort and keep him warm, and oh yea, to play "fetch" with! 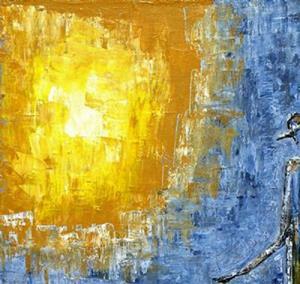 I created this piece by first creating the characters in a dark color, then created the light source by using a small bit of titanium white, surrounded by primary yellow, and surrounded that with a nice yellow ochre. Then I blended it into the blue and white areas, using a pallette knife and I added the blue, white and yellow ochre to the two characters. Then, I added the swirling snowdrifts using titanium white with a touch of yellow ochre here and there for a subtle mimicing effect (mimicing the characters outlines). Finally, I painted the sides black so it's ready to hang, no need for expensive framing here. It is signed on the back, and is varnished for both protection and enhancement of color.